Are you ready to advance your career in data analytics? 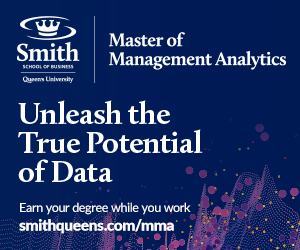 The new Global Master of Management Analytics* from Smith School of Business at Queen’s University (Canada) will put you at the forefront of this rapidly growing field. You can join our next class from anywhere in the world. On January 31st, attend an online information session and learn how you can earn this highly respected degree in just 12 months - while you continue to work. Can’t make it? We’ll email a recording to everyone who registers. Study at your own pace via engaging online courses, led by top professors. Residential sessions in Toronto, Mannheim and Hong Kong will reinforce your learning and establish a network that truly spans the globe. *Prospective students are advised that offers of admission to a new program may be made only after the University’s own quality assurance processes have been completed and the Ontario Universities Council on Quality Assurance has approved the program.